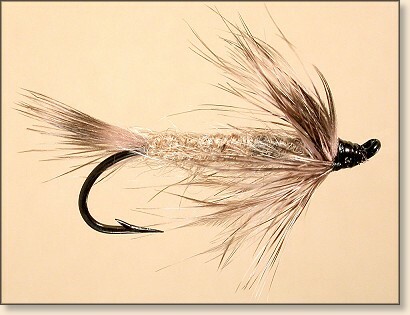 "Tying Atlantic Salmon and Spey Flies, Instruction - Wet - Burlap, Wet Fly, Fly Angler's OnLine"
Tail: Sand colored Chickabou tips. Body: Two strands of burlap. Hackle: Sand colored grizzly saddle hackle. Pretty simple, which works for me. Start the thread and wind to the rear and tie in one Chickabou hackle tip. Tie in two strands of burlap and while wrapping forward, twist. Tie in hackles and wrap to taste. Finish as usual. Son, Brother, Husband, Father, Marine, Mailman, Spud Truck Driver, Fly Fisher, 12 Stepper, High Wire Walker, Story Teller, Good Listener, Flower Smeller, Intellectual in Training, Practicing Humanitarian, and Aspiring Author. I'm a native of Central Washington who spent 28 yrs in the Seattle Area before getting the opportunity to return to my roots, Moses Lake, Washington, in 1996. Since leaving the salmon and steelhead behind my focus has been on the trout of Rocky Ford Creek and the bass and bluegill of the Columbia Basin. I have been happily married to Margaret, the most tolerant woman I know, for 29 years. We have two fine young sons, 24 and 19 in Shane and Eric. I am partial to FAOL fish-ins and trips to Montana to fish with my favorite fishing partner, my younger brother Mike. I look forward to spending more time with my family and my favorite pasttime, flyfishing come October, 2003, when I will retire from the Post Office with 35 years of service.